Dough is compressed between two or more rotating rollers. When done the right way, a smooth and consistent dough sheet is produced. The dough then passes one or several gauging rollers that reduce the dough to the required thickness. After this the dough sheet is shaped into a desired dough product. This technology is mainly used in industrial production machines for industrial bakeries and the food industry. 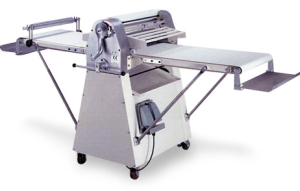 Most dough sheeters can handle a wide variety of dough depending on the machine manufacturer. Most commonly dough sheeting technology is used for the production of laminated dough products like croissants and pastries, but it is also suitable for the production of bread, flatbread and pizza. Shape the dough from individual dough batch to continuous dough sheet. Less damaging of the gluten network. Laminate layers of dough together without pocket proofers. A big benefit for using sheeting technology is the large dough capacity that can be handled. Dough sheeting manufactures are able to process high quality dough sheets at high capacities. An other benefit is that sheeting makes it possible to handle a great variety of dough types which traditional dough production systems can’t handle, for example strongly hydrated wet and sticky ciabatta dough.